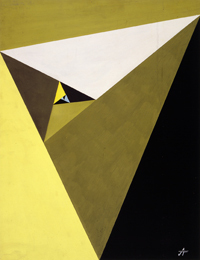 Stankowski’s oeuvre stands out by its wealth of variations; what is played through with the square, for example, will instantly be translated into the triangle of beam shape. The important thing is not a particular formal principle, but the representation of visual thoughts for which shape is only a vehicle. Within the scope of exact esthetics, Stankowski has always emphasized the moment of artistic liberty, and has thus consciously built in interference moments into his pictures – squares falling out of the "order" oblique lines running counter to the "principle".